And faith he'll prent it. 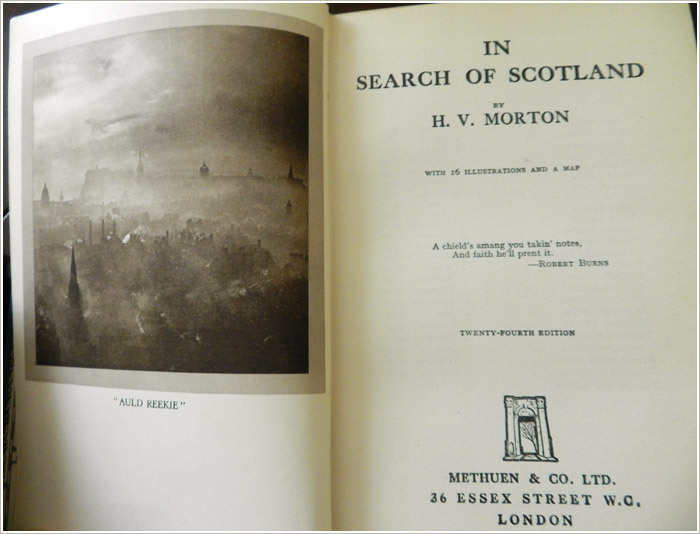 Now, I had never heard of Mr. Morton, but having been born in Scotland, I thought it might make a good read. I wasn’t disappointed; right from the start I was captivated and eagerly followed Morton, a former World War 1 soldier, newspaper reporter and travel writer, on a magical tour of places I knew well, others I knew of, and still others I knew nothing about, between the First and Second World Wars. Part of the magic, I suppose, was that Morton, in addition to writing a glowing review of a bed and breakfast here, or slagging the management of a hotel there, always included historical tidbits about things like: which battle was fought in this glen, how that castle changed hands on the roll of a dice, or how the tenants of that other glen over there were turned out by the landowner to make room for sheep, all of which brought the landscape and the people vividly to life, especially when I vacationed in Scotland and followed in his footsteps.